When you’re the new kid on the block, what is the best way to build credibility? Ok, let’s make that question a little easier. What is one way that you can build some credibility (hopefully) and do it a little faster than it takes our friendly snail in crossing the street? Still not an easy question to answer? You are absolutely right! There are so many components, methodologies, and rules that go into answering that question that one could get lost trying to decipher the answer. So, let’s not. Instead, let’s jump in and get started (as if that isn’t what we have been doing with our online business all along, eh?). It really isn’t about being the new kid on the block and having all of the correct answers out of the starting gate. That may help, but it is about getting the job done right more than being right. After all, if you have the right stuff and get it done right, that will be seen. Yes, credibility is important… VERY important. However, if you do not have a website or any sort of web presence, no one will find you to even know that you have credibility. Is the fog starting to clear? Back to our original comparison between the siblings of online and offline presence. I guess, for that matter, we don’t go around talking about offline presence, so let’s say we are talking about “commerce siblings.” In other words, we are comparing a brick-and-mortar store with an e-commerce enabled virtual store (even if it is an affiliate site). With the offline/brick-and-mortar store, and assuming we are purchasing something that is tangible (versus a service), we possibly have something we can touch. Without that physical component, consumers don’t have the ability to touch your products. Without that, there may be less interaction with you, as the store owner. Yes, you have now entered into the virtual world, the other sibling. Without that “touch,” there is less connection and we have to make up for it in other ways. That is where that digital design and content come into the picture. It is also where we are broadening our example to go beyond just the shopping experience and talking about the site in general. That means that it does not matter whether we are talking about your online store or your blog about kittens. It is about you. It is about your brand. Let’s just say it is about your business and the search for your target audience. Digital Design is a phrase that I decided to coin just for this article. Oh, I am probably not the first one to use it. (Go head, Google it, and see for yourself.) So, why not use an easier term like just “design” or “images?” Well, because there is more to “Digital Design” than just the overall design (which could include the design strategy) or the images (which doesn’t really quite tell the full story). Understanding terminology like branding; image; and so much more! Knowing how to use the right images, the right sizes, and the right posting times for each social network. Knowing how to get an image to go viral on a particular social network; engaging with your fan base. Oh, somebody stop me… This is time for a “List of 100 Components of Digital Design” and the primary reason why it goes beyond the scope of THIS article! And, what do you suppose is the key takeaway for this article? It is to understand, above all else, that design is not just a second thought that happens after you write the article! It may even be the central most component of what you do in the presentation of your online business. For those who are designers, content may be the secondary component. Designers are not only those who are graphical designers, but also include photographers, painters, and artists, to name a few. I used to teach these professionals how to use Adobe Photoshop and I get it. It is true that I may not be able to draw much more than a stick person, but yes, like I said, I do get it. There is a sort of poetry that can flow from the truly artistic. However, at the same time, I remember that these artists many times wanted that moment of being one with the imagery and allowing the design to speak for itself rather than writing content. In other words, in their case, and on that edge of the spectrum (no pun intended), it may be about the image and not about the article, to put it in simplified terms. On the other end of the world is the writer. For them, it is about the content. It is about expressing themselves through their gift of words. If we had to pick one scenario, that is it. The key takeaway is that we do not sit down and create the work of art in words and then treat the accompanying image as a sort of secondary thought. So, in this world that includes Digital Design and Content, we need to realize that they have a symbiotic relationship and need to be allowed to co-exist. We cannot treat them like one is a second thought to the other. If we have trouble wrapping our minds around that concept, it may be time to bring in some other thoughts. In other words, it may be time to include people on our team who think differently from us and help us to complete the picture. Simply put, your images are an illustration that adds “zing” to your page, so unless you have an online art gallery, use graphics sparingly. If not, it might take away from what you are trying to accomplish. A website that is too busy distracts customers. Recall the discussion above and how artists may have a view of one side of the spectrum, while the writer has the other side. This also applies to their respective website(s). After all, the painter is not likely to have the site that only “sells” writing, eh? Your writing style may say quite a bit about you (as it should!). If your site is about your writing/blogging, then go with it. But, be sure to stay focused when trying to deliver your message. Use those tools that help you to improve your skill set in writing. Most importantly, as a writer, do NOT forget the images and the “Digital Design” aspect of your site or blog! Although building brand credibility takes time, you can make a stellar first impression by capturing your target audience’s interest. The image you want to create should communicate both your personality and what your brand represents. This isn’t done with content alone and it isn’t done with images alone. Also, your site should not be devoid of an adequate usability assessment, making it easy on your visitor and encouraging them to return. All of these components (and more) should synergistically co-exist and encourage the growth of their individual skill sets, as well as that synergy. 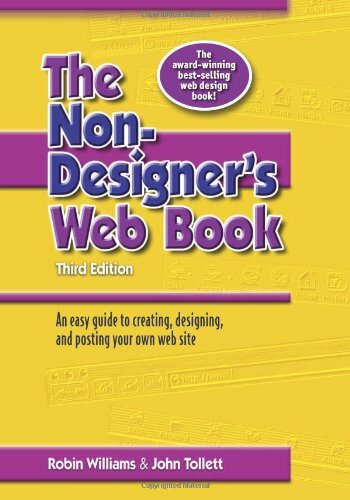 First, for all of your writers out there who do not know the first thing about design, I recommend the following book. I recommend it not because it is an Amazon affiliate product, but because it has been a lifesaver for me, personally, in understanding design from a “simple perspective.” Hey, it didn’t hurt when it came to teaching Adobe Photoshop, either, because it helped me to speak a common language with my students. See for yourself! The second thing? It brings us full circle and that is that you, as writers, need to ensure that those images are not a second thought. They may just save your bacon and help someone to take interest in reading your article or sharing your social post some day.